Комментарий: Загадочные, мистические, иносказательные тексты песен и яркий образ вокалиста группы, Джима Моррисона, сделали группу The Doors едва ли не самой знаменитой и равно же противоречивой группой своего времени. I've addressed Paul Nelson's writings about the Doors before, back in June of 2008 ("Perceiving the Doors"). 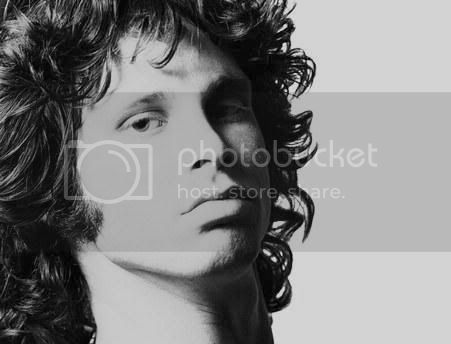 In that same entry, I mentioned that award-winning director Tom DiCillo was at work on a Doors documentary. Now that DiCillo's movie, When You're Strange: A Film About the Doors, is preparing for its U.S. premiere (in select theaters on April 9) and the Internet is abuzz with anticipation, it seems like a good time to post this ad from July 1967, which incorporated part of Paul's Hullabaloo review about the band's first album. Just click on the image to enlarge it. And, while we're on the subject, here's the trailer to DiCillo's film, which is artfully composed entirely of period footage, much of it previously unreleased. Should you miss DiCillo's film in the theater, fear not: it's also scheduled to appear on PBS's American Masters series on May 26. Copyright 2010 by Kevin Avery. All rights reserved. “Хорошая черта кино - то, что здесь нет специалистов. В кино нет авторитетов. Каждый может сопоставить с собой и вместить в себя всю историю фильма - этого вы не можете сделать в других видах искусства. Нет специалистов, поэтому, теоретически, любой студент знает почти столько же, сколько и любой профессор”. "I see myself as a huge fiery comet, a shooting star. Everyone stops, points up and gasps 'Oh look at that!' Then whoosh, and I'm gone...and they'll never see anything like it ever again. And they won't be able to forget me--ever." Please post your favorite images, quotes and/or lyrics here, and some kind words for Jim if you like. And Jim. To see him sing is like witnessing a man dangling in some kind of unique and personal pain. Watching Morrison come face to face with some ultimate truth in song can be truly frightening. The shrieks and screams come from a subconscious layer under the conscious artistry: Morrison is levels, not all of them pretty. "It is close to my own view of what distinguishes the group," DiCillo continued, "but he writes extremely eloquently and with real, knowledgeable detail. I thought his review of the first album showed real perception." In fact, so alive was Paul's forty-year-old prose that DiCillo had a request: "Can you please pass my admiration on to him?" I informed him that Paul had passed away in 2006. "I had no idea," he replied, "It touches me deeply. It has much deeper meaning now." It's here at this link: http://www.lulu.com/content/1164503. A rock n' roll murder mystery. It sounds like a lot of fun. And her live journal is pkmorrison. ...has a live journal, pkmorrison. It's friends only, but anyone can read it. She has a new book coming out, a rock n' roll murder mystery. Details are on her journal. 7:32 they play "Wild Child"
27:07 John talks a little about Robby's black eye and the big awkward pause where Jim forgets to come in on "Touch Me". they play the song right after (at 27:45). 42:10 they have just a little bit of John being a little adorkable (but not saying anything important/enlightening). And, uhhhh, that's all I have right now, so I hope you enjoyed. Ok, so some of the stuff is posters that I don't have (although I'd pretty much die of awesome if I had the Universal Mind one), some really common pictures, and just some more random stuff I have kickin' around so I hope some of it is new to you. Don't worry, this (incl. previous posts) probably isn't even half of my stuff so there could be more coming if you'd like. We got Photoshop CS3 at work and I figured I'd make some icons to try out the program. PS: I got all the pictures (except the "Just Jim" one) from poor_echo. So, poor_echo, if you see this, thanx and I'd love it if you could post some more for future icons and lots of drooling. I wish this community updated more (in English) because I love The Doors so I have taken it upon myself to do it. here are some icons I just made, most because I was playing with fractals. Here’s a version of Jim Morrison’s death which explains all the mysteries surrounding it. "I see myself as a huge fiery comet, a shooting star. Everyone stops, points up and gasps "Oh look at that!" Then - whoosh, and I'm gone... and they'll never see anything like it ever again, and they won't be able to forget me - ever." So does anybody know French? I only pretend to speak it (because of my very French sounding last name), I only knowing a few phrases from elementary school, but that still couldn't stop me from buying this book. Yeah, sorry for the random update, just trying to keep the community "alive she cried..."